On 8 September 1954, lone Englishman Ted May set off from Cap Gris Nez to swim to England, but without a pilot boat and against official advice. His body was found weeks later washed up in Holland. Edward James May was born in Dartford, Kent. He was father of 9 children. His wife was Florence Beatrice Hyne of Dartford. May served with the Royal Navy during the War as a stoker and then petty officer. He was employed as a Pipe-fitter and engineer with Brown & Tawse Ironworks at Bromley-by-Bow in London but moved to Scunthorpe to find work as a boiler maker in about 1950. His wife and family remained behind in their council house in Dartford, May returning when he could. May was a keen long-distance swimmer, and a member of Barrow ASC. For his Channel attempts he was trained/managed by Mr. Louis Scott of Scunthorpe & Leeds, a jeweller. May applied for the 1951 Daily Mail Cross-Channel Race and was tested by Race Organiser Sam Rockett at Kentish Town Baths. Rockett thought May was a capable swimmer but, with just 20 places available, rejected him in favour of stronger swimmers. If he had been successful, the Daily Mail would have paid all his expenses and costs for the swim but, without a place, May would have to find the £250 to £300 minimum it then cost to swim the Channel. He tried to raise the money in sponsorship and in prize money from other swims such as Lake Windermere, Isle of Man to England, etc., even once attempting to win a prize of four fat cows, but never got very far. He applied again for the 1953 and 1954 Channel races but again Rockett turned him down. Convinced Rockett had something against him, May was determined to make the swim off his own bat and, as he had no money, to dispense with a pilot boat or any other form of back-up. 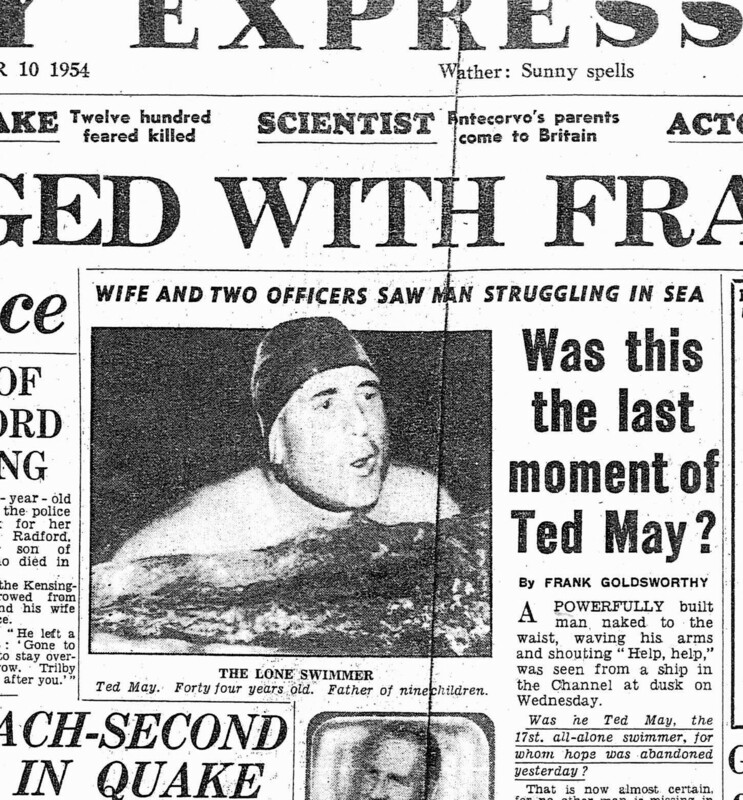 He set off from France on 23rd August 1954 but bad weather set in after 8 hours and he was in trouble. An air-sea rescue was launched, involving 2 British destroyers, a helicopter, coastguards and lifeboats, before a Finnish steamer picked him up. “I constructed from a blown-up motor-car inner tube a pannier – made from a coffee tin – containing a compass, two bottles of rum, sliced chicken, sugar and biscuits. I struck out from Cap Gris Nez with the inner tube and pannier strung out behind me. After about 5 hours I wanted something to eat so I pulled in the tray and found that the chicken and biscuits had been washed away. The bottles of rum were still there and I took a long drink. I swam for another hour and then saw ahead of me the white cliffs of Dover. My confidence was greater than ever. The sun was shining, the skies were clear. Then suddenly the weather changed. The skies went black, the surface was ruffled by the wind and rain started. I decided to swim back to France. I swam for about 2 hours and then over the horizon I saw the masts of a ship. I shouted and waved and the steamer came alongside. By this time the sea was so rough that they could not pull me aboard a lifeboat. Instead they tied a rope around me and pulled me on board”. Despite such a sharp lesson in the fatal dangers of the Channel, May, in what has been described as an act of “colossal stupidity… foolhardy and suicidal”, decided to try again. A car crash the day after his rescue kept him convalescing for a while but two weeks later he was ready to try again. On the morning of Tuesday 7th September he said goodbye to his wife, caught a bus from Dartford to Dover and crossed the Channel by ferry. The English authorities had tried desperately to dissuade him and in France he was detained by the Calais authorities and his passport seized. They had to let him go after being informed from Paris that there was no law to stop him. Monsieur Sumian, the Calais Commissaire Speciale, told him he was going to his death but May would not relent. Aged 44 and weighing 17 stone, May set off from Cap Gris Nez at 4.45 p.m., towing his rubber tyre inner tube raft holding bread, jam and brandy and his clothes. 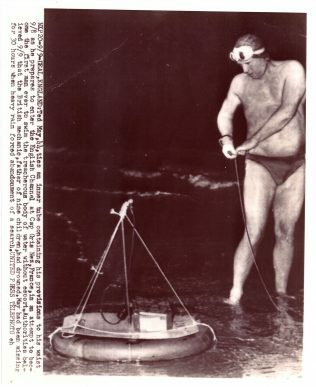 The raft had a 2ft mast with battery operated lights on it. He had put on 3 layers of grease and was wearing a cap and goggles with a wrist compass. Again, unexpected bad weather set in and all those waiting in Dover knew May would be in trouble. He was last seen at 7.30 p.m. on Wednesday 8th September 1954 (15 hours after he started) when the crew of the British tanker ‘San Vito’ saw a man in the water shouting for help 4 miles south of the East Goodwin Lightship, about 8 miles off the English shore. At almost the same time a fisherman reported seeing the tyre tube adrift with 2 bottles in it, about 8 miles off Calais. On board the San Vito, a lifebelt was thrown to May, who was then only 20 or 30 feet from the boat. It fell short and the boat turned around but in the 8 minutes it took to stop and turn the boat, May had disappeared. A ‘Man in Sea’ SOS was broadcast and other ships, including 2 warships with searchlights, joined the search as did American and RAF planes, but nothing was found. He was officially reported missing at Dover Police Station by his wife on Thursday 9th September. The sea-rescue searches were called off after 30 hours. Florence, with her daughter Patricia and Ted’s brother Albert, remained in Dover waiting for news. Opinion was equally divided about whether May was a hero or a fool and the debate dominated editorials and letter pages in all the local, regional and national newspapers. In a Daily Mirror poll 51% of their readers thought him a reckless and obstinate fool and 49% thought him a courageous and inspirational hero. The main criticism seemed to be of the enormous cost of the air-sea rescue his actions incurred, for a second time; this included the Walmer lifeboat, the Dover lifeboat, a USAF Grumman Albatross, an RAF Shackleton from Cornwall, an RAF high-speed launch from Felixstowe, etc. One newspaper calculated that the cost of the flares dropped by the Albatross alone, would amount to £334. And that the total cost of the exercise, without labour, was £2,400, then more than the cost of a house. 3 weeks later his body was washed ashore at Bakkum in Holland, still wearing the wrist compass. He was buried at Watling Street Cemetery after a ceremony in Dartford Parish Church led by the Bishop of Rochester, his ashes being interred in the grave of his first son, Edward, who had died in 1938 aged 1. The Bishop called him an exceptionally brave man and went on; “It is not for us to pass judgement on that absolute self-confidence which seems to have blinded him to his responsibilities as a husband and father. Outstanding everything is the courage of the lonely swimmer, and in him was the same stuff which has enabled man to stand on the top of Mount Everest”. He left behind 9 children; Patricia, Doreen 23, Florence 21, John 16, Peter 11, Colin 9, Janet 7, Sylvia 5, and Dennis 3. The 1955 Butlins Cross-Channel Race was won by Abou Heif of Egypt. He dedicated the win to May and gave £50 of his prize-money to May’s widow.